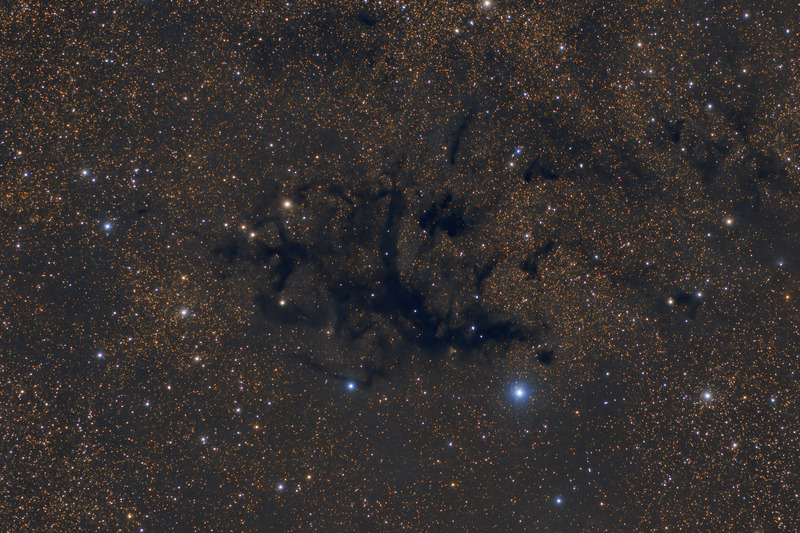 At a distance of about 600 light years from us, LDN 673 is a beautiful dark nebula covering almost a full degree of sky in the constellation of Aquila. The nebula is superimposed upon the thick molecular clouds within the Milky Way. The dust in these molecular clouds scatters the blue light from these stars, giving the surrounding stars a decidedly yellow-red bias. In this image, North is to the right. This image is cropped to 61% of the original full frame. Software Used Images Plus 5.75 for camera control. Images Plus 6.0 for calibration, stacking, digital development processing, star shrinking and halo reduction, smoothing and noise reduction. Photoshop CS5 used for levels and curves, match color, lab color, cropping and selective color. Pixinsight 1.8 for dynamic background extraction, background neutralization, and color calibration. HLVG for additional color correction, Gradient Xterminator for gradient removal. Carboni Tools for additional noise reduction and smoothing, Focus Magic for focus restoration. Registar 64 for stack alignment. Notes LDN 673 is a fascinating target. Because there doesn't appear to be any faint nebulosity associated with the object, I invested less time in capturing data than I normally would. However, I ended up with a good signal to noise ratio and I think the final result is quite nice. This image was published by Astronomy Magazine as its Picture of the Day for June 15, 2017!